Black Ball Brewing Company’s motto is “No Surf? Drink Beer.” Although this is a great option, a better one is paddleboarding, which builds strength and endurance for the next swell. Paddleboarding is thought to date back 2,000 years, to before the Polynesian migration across the Pacific Ocean. In the early 1900s, Hawaiians raced heavy, solid, 10-foot koa boards. A new era of prone paddleboarding began in 1928, when Wisconsin native and South Bay resident Tom Blake arrived at the annual Surfboard Paddling Championships in Waikiki with his revolutionary hollow paddle board. He won that year and again in 1929, over protests from locals that his boards should be banned because they weren’t surfboards. In 1930, he smashed the race record paddling his 16-foot, 75-pound, cigar shaped board. Following that victory, the race committee recognized that a new era had begun for boards designed exclusively for prone paddling. In 1932, Blake convinced Santa Monica Lifeguards Pete Peterson, Wally Burton, and Chauncy Granstrom, to train for a paddle from the Palos Verdes Peninsula to Catalina Island. Blake wanted to, “prove the paddleboard was a good rescue device.” Granstrom pulled out before the event, but on September 30, 1932, Blake and the other three paddled to Catalina, escorted by Santa Monica Lifeguard dorymen, Bob Butts and Pat Lister. The O.C. Olsen Company boat “Gloria” led the way with course timers and a doctor on board. 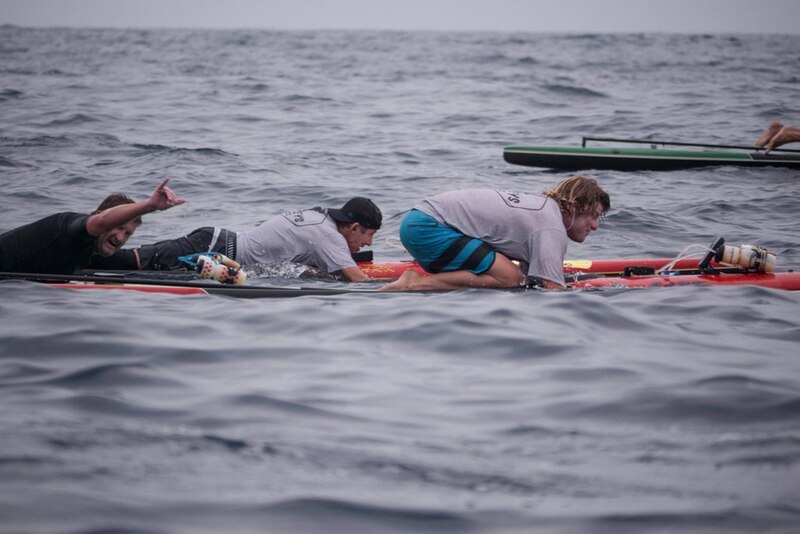 While it was not intended to be a race, Blake broke away as the paddlers approached Catalina Island and finished in a time of 5 hours, 23 minutes. Peterson and Burton followed in six hours, 31 minutes and six hours 53 minutes, times that would be competitive today by paddlers on modern boards. Newspapers trumpeted the achievement. One headline read, “Guards Conquer Catalina Island”. Blake’s hollow Catalina Paddleboard Company boards were in production from 1932 until the early 1950s. Around 1940, Blake, who was coaching the Palos Verdes Swimming Club, founded the Malaga Cove Paddle Board Club. Founding members included not only Blake but Jack Bauman, Virginia Bauman, Chilton Moore, Bob Norman, Dendy Sadler, Mary Bieling, Jimmie Damon, Curtis Burks, Roberta Mull, and Larry Stone. In 1955, Manhattan Beach Chamber of Commerce leaders Cliff Webster, Bob Jean, Paul Garber, Bob Reuben, Lee Cave, Hal Newell, Bob Smith, and Bud Caldwell, to name a few, joined forces with L A County Lifeguard and Manhattan Beach resident Bob Hogan. 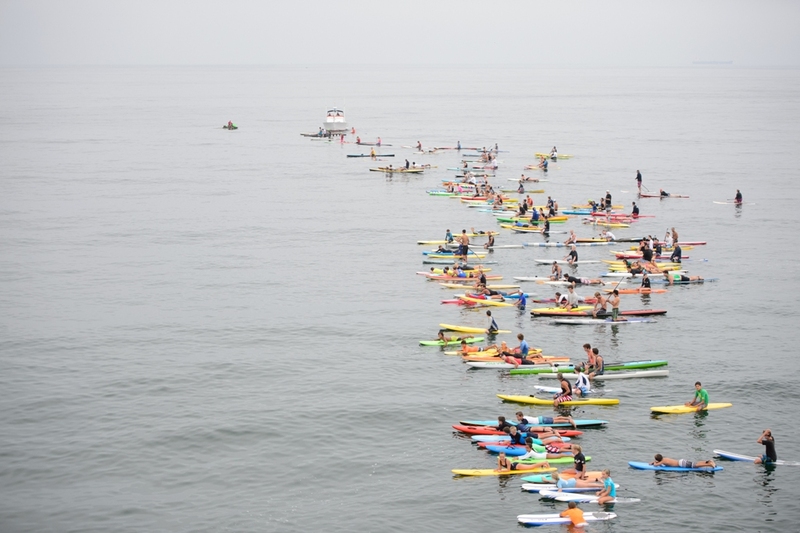 Together they created the Manhattan Beach International Paddleboard Race. The 32-mile marathon started at Isthmus Cove on Catalina Island and finish on the south side of the Manhattan Beach Pier. The Chamber’s goal was to bring attention to its growing beach community. The first couple years, competitors used Blake designed, hollow boards borrowed from the Santa Monica Lifeguard Service. Hogan was expected to win, but got lost in heavy fog and finished a mile north of the pier, in Playa del Rey. Another favorite, Greg Noll, also missed the Manhattan Pier and finished at the El Segundo oil pier. The young Ricky Grigg of Santa Monica won that first race. The following year, 14-foot and unlimited divisions were established. Paddlers switched to much lighter, fiberglass paddleboards. The race was held through 1960 and dominated by Mike Bright and Tom Zahn. The race was canceled in 1959 race due to pier construction and again in 1961 because of rough ocean conditions. Cliff Wester’s death the following year led to the race being suspended until 1982. In 1982, LA County Lifeguard Lieutenant, Karl “Buddy” Bohn was asked by the Manhattan Beach Historical society to find a 1950 paddleboard for a museum exhibition. After finding an old “kook box” abandoned under a house, Bohn was convinced by several of the original Catalina to Manhattan paddlers to resurrect the race. Chamber executive director Trudy Smart agreed to turn over the race bylaws and articles of incorporation to Bohn, who enlisted fellow county lifeguard Weldon “Gibby” Gibson, who had participated in the 1950s Catalina to Manhattan races. Together, they established the Catalina Classic 32 Mile Paddleboard Marathon. The stock division was changed from 14-feet to 12-feet, but otherwise the Classic rules adhered to those of the original race. Several members of the Catalina Channel Swim Federation offered help with logistics and safety, among them John York, Siga (Gudmundsson) Albright, and Cindy Cleveland. Some of the Federation’s swimmers became Catalina Classic paddlers, as well, including John and Andy Hill, Cindy Cleveland, Dave Yudovin and Cathy Moore. Mickey Pittman volunteered as the lead boat for the 1982 Catalina Classic. For most of the subsequent years, the 60-foot Body Glove boat Disappearance, skippered by Body Glove and Dive N’ Surf founder Bob Meistrell, served as the lead boat. The Catalina Classic has been held consecutively since 1982 with the tireless help of many committed volunteers, among them Gibson, Bohn, Steve Fairbrother, Cindy Cleveland, Joe Bark, Tom Allen, the Meistrell family, Glenn and Pam Dexter, Jeff Petty, Scott Hubbell, Kevin Barry, Kyle Daniels, Matt Walls, Gene Rink, Theresa McDowell, Francziska Steagall, Bob Willis, Paul and Kyle Morgan, Scott Rusher, the L.A County lifeguards, and countless others. Since the South Bay Boardriders Club inception in 2009, members have had frequent discussions on how to support the sport of prone paddleboarding, and honor its pioneers. Those discussion have led to the club supporting three local paddleboard races, an introduction to paddleboarding program and a memorial to the sport. South Boardriders Club members Ed McKeegan and Jim Sepanek have co-directed the Velzy-Stevens Paddleboard Championship since 2011. The race is named after pioneer Hermosa Beach surfboard and paddleboard builder Dale Velzy and surfer and Catalina Classic Paddleboard winner Terry Stevens. The race is one of the most popular International Surf Festival event, held on the first weekend of August. The race starts at off the end of the Manhattan Beach pier and finishes on the sand, at the Hermosa Beach pier. This year’s Velzy-Stevens Paddleboard Championship, held August 5, attracted 151 paddlers, from ages 9 to 69. Paddlers competed on unlimited and prone racing paddleboards, stand-up paddleboards, surfboards and soft-tops. Paddler Caleb Brown, of Hermosa Beach, recorded the winning time, of 17:35. But Velzy-Stevens isn’t just a race. It’s also about inclusiveness. We had 86 paddlers 17 years old and younger and and we had 27 paddlers over 50. To register for the 2019 Velzy Stevens Paddleboard Championship, visit SurfFestival.org. In 2018, SBBC collaborated with Catalina Classic Paddleboard Race committee members Matt Walls and Scott Rusher, and the City of Hermosa Beach to found the South Bay Paddle, a 15 mile race from the Hermosa Beach Pier, south four miles to the Palos Verdes Beach Club, four miles out to sea to the R10 buoy, and back to the Hermosa Beach pier. The race serves as the only South Bay qualifier for the 32-mile Catalina Classic. Nearly 100 paddlers competed in the inaugural race, with nearly one-third qualifying for the Catalina Classic. Also for the first time in 2018, SBBC, put together two 4-person relay teams to participate in the Rock 2 Rock Paddleboard Race, a 22 mile channel crossing from the Catalina Isthmus to Cabrillo Beach. The race is organized by Redondo Beach R10 Restaurant owner George Loren. Mom Amy, dad Joe, and daughter Emma Waldinger and Ruben Barajas formed one team. Jani Lange, Gus Garcia, Paul Towers, and Tom Horton formed a second team. The good times and sense of accomplishment has led the club to make this an annual event. Prone paddleboard designs have changed dramatically since the resurgence of the Catalina Classic in 1982, and the cost of these boards has grown significantly, as well. New boards are over $2000, while used boards in good condition typically sell for $1,200 or more.. To offer interested paddlers an opportunity to try the sport without having to purchase a board, Hermosa Beach resident and Catalina Classic paddler Kurt Fry formed Ocean Prone Paddle (OPP) this year. OPP offers 14 new Bark paddleboards for rent on an hourly, daily, weekly, or monthly basis at an affordable rate.